Over on deviantART one of my favourite groups, Project Educate, is holding an Artisan Crafts contest. The theme this year is "Circus". 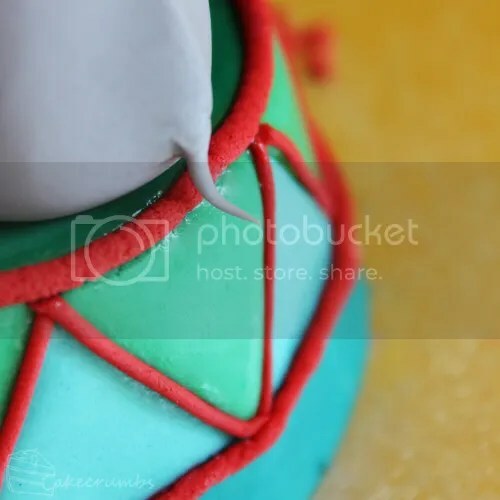 I've been wanting an excuse to do a circus cake for forever. Alas, with the weather being as phenomenally hot as it is, I couldn't days working on an epic cake. So I had to downsize. When I think circus, my first thought is my favourite: Cirque du Soleil. Particularly since I just recently witnessed their amazing Ovo show, as well as the Cirque du Soleil "Worlds Away" movie. I well and truly have cirque on the brain. 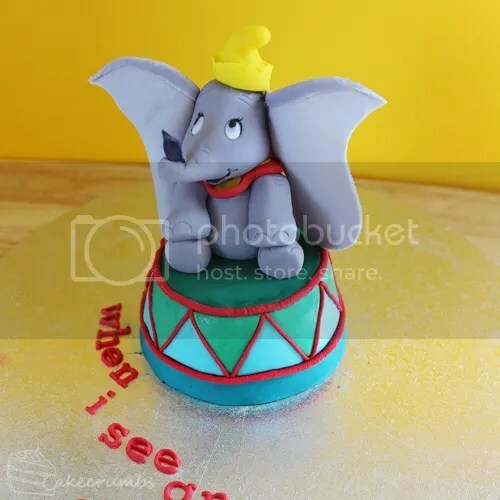 But doing a cake that did that amazing circus justice was out of the question, do I went for something a little smaller. My second thought when I hear circus is everyone's favourite elephant. Dumbo was one of the first Disney movies I ever saw, and definitely one of the videos that endured constant rotation in my parent's VCR. 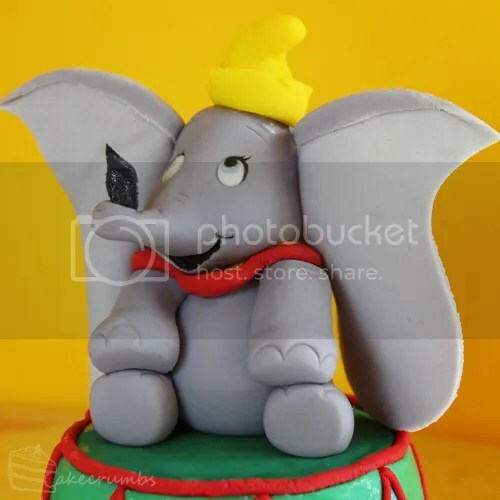 He sits perched atop a pedastal made of red velvet cake, buttercream and fondant. One thing I noticed when going through old photos and videos is that the colours all change from version to version, country to country. So I picked one style and stuck to it. The ears were an absolute nightmare to get to stay on and upright, but we sort of got there in the end. I had to include a tribute to everyone's favourite Dumbo song. We've all got this song stuck in our heads now and have been walking around the house incessantly singing it. And of course I had to give Dumbo his magic feather. I'm terrible at mimicking and realism do it's not exactly his likeness. I had 3 attempts at the head before deciding I wasn't getting any closer. It was a good excuse to practise some fondant work, though. But I have to admit to falling in love with his tiny tail. Aw, this is too cute! Did you win? Very cute cake! 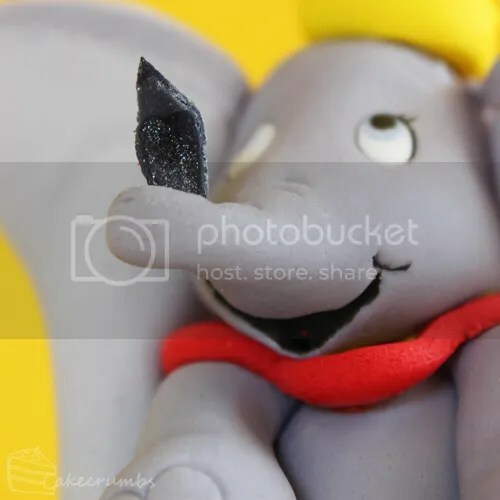 I love the expression on Dumbo’s face. 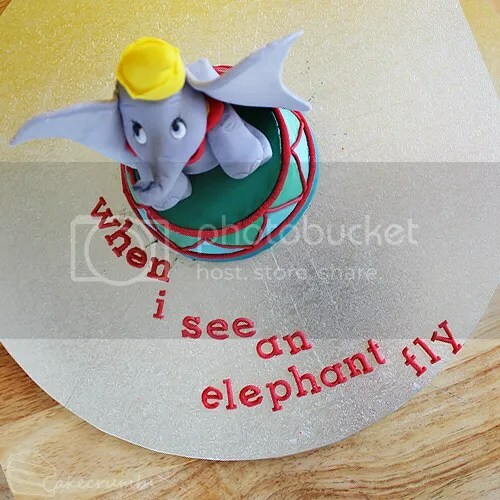 This is amazing, how did you make Dumbo’s colour? I use gel pastes to colour the fondant.